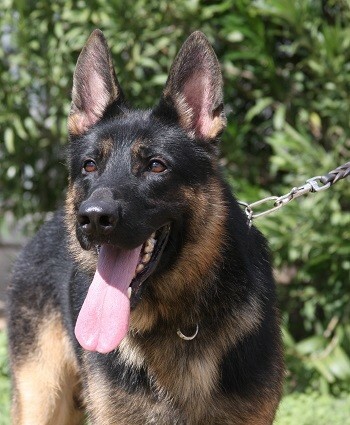 Lothar Young Trained German Shepherd Male for sale. Lothar vom Zauberberg is a stunning German Shepherd Male that has very pronounced pigmented color. He is strongly built and very well structured. His face and type is very pretty and harmonies. Lothar’s temperament is absolutely solid. He loves all people. He is an upper medium sized German Shepherd Male, with very open minded attitude. Super family companion that likes to play and please. Lothar will be available as trained adult, going through the ELITE Obedience training at Zauberberg Kennels. Interested in Lothar vom Zauberberg?